By interviewing Bart Rutten from Stedelijk, Margaret Tali examines how American-style sponsorship models enter European museums and what this means for the institutions. This total makeover of the Stedelijk also involves a new approach to sponsorship in which the museum now follows the American model, with its spaces being sold to any who can afford them. The Stedelijk has traded the smaller spaces in its new building to different companies, banks and foundations. Those deals are valid for ten years, and this is undoubtedly a very important change for the museum positing an important question: how does this decision affect the critical discourse that the museum wants to create and participate in. During the recent budget-cuts in the arts and culture in the Netherlands, the Stedelijk clearly positioned itself as a space standing with the artists, and thus against the state. It actively took part in the debates, some of which were organized in its spaces. Time will tell what this sponsorship-related spatial change means for Stedelijk's position in the local art scene. The permanent display of the new Stedelijk can be best characterized as a safe choice with no surprises, introducing the key pieces from its collection that follow a linear narrative of styles and schools in combination with spaces dedicated to artists. Since the director of the new Stedelijk, Ann Goldstein, has remained reluctant to air her visions or long-term plans, I went to talk about these plans, the image of the Stedelijk since it re-opened and its approach to its audiences with its leading curator, Bart Rutten. Exhibition view at Stedelijk, photo by Gert-Jan van Rooij. You have been one of the curators of the opening display and some of your Amster-dam colleagues call you "the leading rapper" of the Stedelijk museum, but can you explain in a few words what is your work about? Oh really, I didn't know that, this is flattering! I am a collection curator. We make a dis-tinction here at the Stedelijk between collection curators and exhibition curators. This was very clear under the former director, Gijs van Tuyl, but after the arrival of the current director, Ann Goldstein, two and a half years ago, that distinction is not there any more. But I am still very much connected to the collection and this is one of the reasons I had an opportunity to collaborate with my colleague Geurt Imanse on the display for the early 1870s until 1960s. There Ann (Goldstein) was involved but not as present. Upstairs, 1950 to the present, we teamed up; I curated with Leontine Coelewij and Hripsimé Visser, and with Ann who collaborated in the hanging of this period. This was a matter of making your wish-list, fighting for some works, because we have so much more. We decided to open the museum earlier. Previously we planned an exhibition of Mike Kelley for De-cember, which together with his death in 2012 became a retrospective. In the basement space we arranged large-scale installation works with Ann directly, so I was part of all the teams and could also connect the different plans and see some kind of unity between them. You started building the collection display by choosing 30 works: were these big names, like Picasso, Mondrian and De Kooning or iconic works? Yes, they were icons. We know the most beloved works from the collection. Malevich is so much in the core of this institution, Chagall who is so much collected here, Karel Ap-pel, Asger Jorn, Jean Dubuffet. So it was more that we started with priority lists of artists that we thought were important to include for the reopening. That was really the basic structure from which we started curating the rooms. We looked carefully how other mu-seums do that. Tate Modern thinks of a broad theme, and presents works from their col-lection under that umbrella. This was something that we didn't want to do because you already narrow down the appearance of the work through forcing people to look at works through the perspective of this common theme. I don't believe in this. Each piece is an individual work of art, and it should speak for itself. That's why we made the selections of 4-5 works per room and decided what we wanted to present next to them. We chose approximately 130% of what we could actually have in a room, and then we had to "kill our darlings" and make the final choice. It seems that the public has welcomed the opening of Stedelijk warmly, judging by the daily queues in front of the building, but the critics are more distant and some say that "something is missing". Yeah, we have been missed and this is nice to realize. The critics were first of all positive, but we have been criticized about not doing more to explain why some combinations have been made. Especially upstairs, in the display of art since the 1960s, people are longing for more explanation, but we decided that we will have the works speak for themselves in order to not narrow the interpretations down. The other critique has been that we are too classical with the opening show, but I find that as a compliment. Because since we were missed, you should really open with the best of the best that we have. This is the basic set up, and from this we can build up change within the display. One of the things that I personally think is missing is that there is very little transla-tion of the discussions that have occurred in the Dutch art world and museums over the past couple of years concerning colonialism, or Western Europe opening up to-wards the East, and towards Asia and North-Africa? There is not much globalization upstairs, and I am very proud that we are starting with it downstairs. There is a room with modern painters from South-America, and of course a room of Malevich and his contemporaries giving some sort of idea about what was hap-pening in the East of Europe. Upstairs, I totally agree, but it has to do with the classical discourse that this museum always had – we are famous for the collection of painting as it was collected in the 1960s when globalization was not an issue yet. Upstairs what you find most non-Western is Japanese artists, so there is quite a strong Japanese line there. There has been quite a lot of collaboration between Japan and the Netherlands with the Zero group of artists looking for the Gutai-movement. We are starting a program, a re-search curatorial program about non-Western approaches and non-Western views, but something that we try to avoid is becoming an encyclopaedia covering everything because that's mission impossible. Tate Modern can do that in a way with their staff and budget being 30 times bigger than ours, so we should define what is the most logical connection to our collection and then we end up with a focus on the southern part of Africa. We could pick up the lines from our earlier collection from South America. This is an area, which talking about prices, is booming, and for us it is almost impossible to buy iconic works from the 1960s and 1970s. All big museums in the world think that they should also tell this story. For us as a smaller institution it is very difficult. Do you approach the display that you have curated as the permanent collection or how will it change? Downstairs it won't change so much during the first year unless there are loans. For in-stance there are a couple of works by Malevich going to New York and a Mondrian going out. That gives us the opportunity to temporarily show other works. All the works on pa-per can only be displayed for three months, so that constantly forces us to rethink the col-lection setup. Since the museum is closed only on Mondays, this is the time we have for realizing those changes. So constantly small rooms will change and it's a permanent dis-play only in the sense that rooms are reserved for showing the collection. Some excep-tions are there: De Kooning and Barnett Newman will be there always because they are so iconic, also bringing people from all over the world because they want to see that. All the works are not there; for instance, a very famous Roy Lichtenstein triptych is on a travelling retrospective right now and returns at the end of next year. What is missing on the display right now is a set up of pop art – we have a beautiful collection of pop art, it is not there now. A couple of artists have their own spaces in the display, like Willem de Kooning and Rineke Dijkstra – what was this decision based on? That was a deliberate choice. If you walk up the stairs on the two sides there are central rooms that we see as starting points for the collection – there are two times female Dutch Amsterdam-based artists spaces, Rineke Dijkstra and Marlene Dumas. There are also separate rooms for Karel Appel and upstairs Erik van Lieshout. What we tried to do upstairs is to have sometimes more monographic and sometimes cu-rated rooms and they will change, but we will keep the place for Marlene Dumas for the coming year. Although nothing is for sure, but from this position we will start changing things. At the moment there is not a lot of video on display since we wanted to show our building and video is not the best thing for this, but more video interventions will appear. Stedelijk has such an impressive graphic art and design collection, which has been unseen for a long time. We have specialized curators for this. 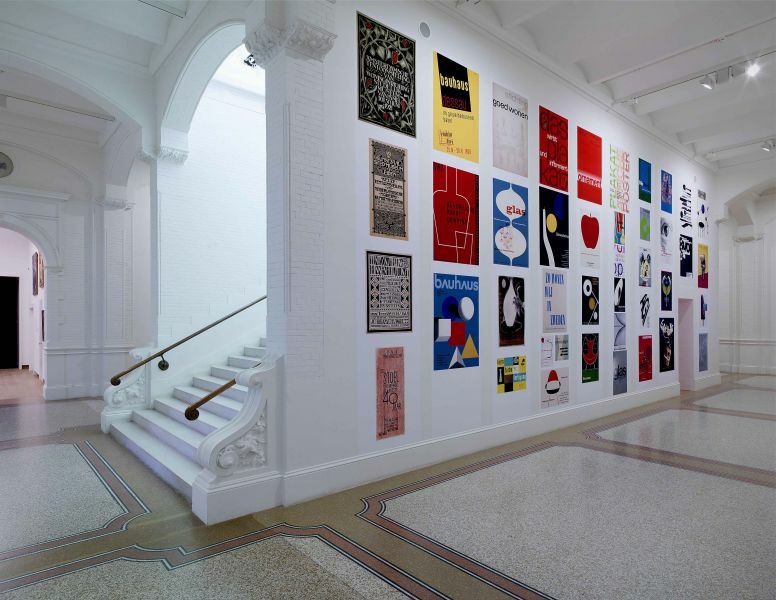 It is the biggest collection at the Stedelijk, with over 30 000 pieces and right now it is mainly original prints integrated with the display of applied arts. The whole applied arts section is a totally integrated display of free design, applied design and graphic design with some photography interventions. In the begin-ning, brainstorming about the collection set up, people also thought of integrating it with the display for the arts section, but the more contemporary you get the less sense it makes. Presenting an installation next to a chair or a monumental painting next to a cabinet doesn't really make sense, so that was a decision to present them separately. In the applied art section, graphic design has a key role. Again very delicate and all those works need to change every three months. As a part of my research, I look at museums as economic bodies and examine ways in which this has an influence on what happens inside the museum, what is displayed and how. One of the things that has been very interesting for me in this respect was the way that corporate funding is approached at the Stedelijk and how does it show. What does it mean that Stedelijk has spaces like the Schiphol hall or ABN Amro zaal as a part of its display? Furthermore, how does it affect your work as a curator? It does not affect my work at all, except for the fact that we have a sign somewhere. They are absolutely out of any rights over the content of the room. Nothing to say about that. But what they can do is, depending on the size of the sum, is to choose the room, its very strict. Funny enough they had to choose the rooms when the museum was still emp-ty, so most of them went for the size. I don't know anything about the sums, but if someone gives half a million means that they get a bigger room than someone who gives 200 000. Most people actually look at the size rather than the content and they knew that the old building will be used for the collection and the new one for changing displays (and that can change a bit), but I know that the VandenEnde Foundation was very keen on having the biggest room in the new building, so they donated a lot of money so they could choose what they wanted. For ABN Amro, that supported heavily, it was important to have the biggest room in the museum, which is in the basement. So it is the economic way of dealing with size and has nothing to do with the content, because when looking at the display the most expensive rooms are still available. That's a strange disconnection, if you look at it that way we should sell our Malevich room for a lot of money! But are those corporate spaces still flexible as spaces? For instance, can you change the walls? So this means regardless of what is on the walls of the halls that have been sold? Well, the development department might think something else, but the way I see it from the art department is that companies should be proud that they are part of this institution and very polite and stay in the background. That's not always what the companies think. Well, good companies will think that way, but it's very active and we are forced to look more towards the private funding, it has to grow from 15% to 30%. It seems that many art museums are starting to struggle with the question of how to diminish the art historical expertise and allow the public to have a say in what is displayed and involve them in some form of decision-making about what happens in the museum. We don't believe in the cult of the amateur. We think of ourselves as an institute which deals with the best of the world, and that means people who have dedicated their lives to art. So if we work with people who are not from the museum, then they are extremely experienced guest curators. The role of the audience is that they can comment on that, and we will answer. We receive a lot of e-mails and we always reply, sometimes at length, sometimes briefly. If you want to do something with the audience then you should frame it as a project with the audience. Because we are not playing doctors and voting for the way you should treat someone. It's a specialty, not a hobby! We strongly believe that people who are educated to deal with audiences should talk to their audiences and listen to them. But that's not enough – one should also translate the wish of the audience to-wards a model or a system. I don't believe in amateur driven internet voting based pro-jects at all. There's a wonderful book by Andrew Keene written about it, "The Cult of the Amateur" (2007). It explains why the amateur is not in charge since for them it is some-thing you do next to the other stuff you do, for the specialist it's their mission and com-mitment. So that's why I think it's important to listen to the needs of the audience and translate it into the knowledge that we have to offer. I guess this is also where the new program of the Stedelijk, the Blikopeners, comes in? Yes, we select representatives from the audience group which is very hard to reach – people between 15–25 are the most difficult to connect to, so that's why we have them – and have them talk to their audience in their language and their level of concentration. No, they are maybe too independent. They are very allergic to things that come from a hierarchical position. They are, but I like the Blikopeners very much. They are able to ask very interesting and open questions, you take that more seriously than someone who is shouting something through the internet. This is something that is annoying me: the communication through the internet is very much as if in the street, very fast and often not very thoughtful, in-cluding naming and bad language and I believe we should defend also some sort of other part of culture. Yes, and there it is very anonymous. If you see how this is influencing our politics and our culture; the need to protect it is there. This is not a Stedelijk policy but I strongly be-lieve in the museum as an institution, which is secure in the values that we protect. And they should be protected too. Margaret Tali is a PhD student at Amsterdam University and a Sandberg Institute lecturer.